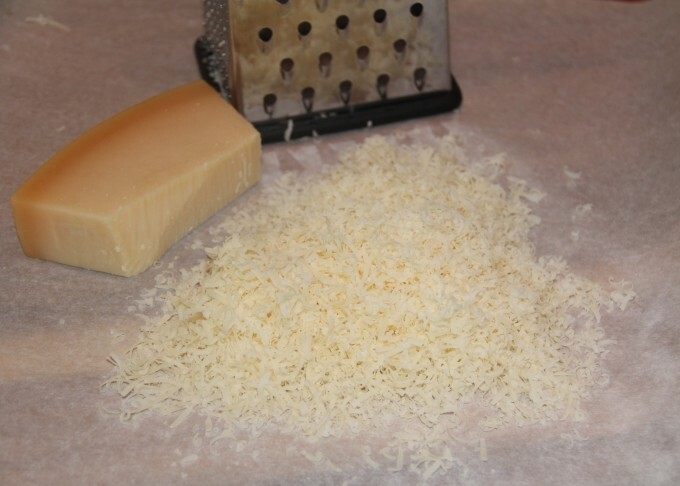 You know something’s good when this is part of it…grated Parmigiano Reggiano cheese. Add some roasted jalapeno peppers and fresh cilantro and well, you’ve created something amazing. 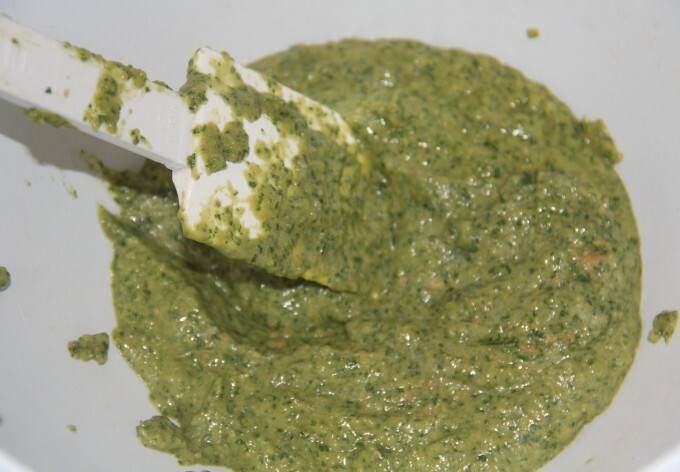 Jalapeño cilantro pesto can be used to enhance fish, chicken, pork or even just vegetables. I’ve made it a couple of times over the summer and we have fallen in love with the zesty flavor of the fresh jalapenos and cilantro. Start with 8-10 jalapenos and place on a cookie sheet, drizzle with olive oil and then sprinkle with salt and pepper. Roast at 400° for about 20 minutes. Then stick the peppers in a bowl and cover tightly with plastic wrap and wait 15-20 minutes. Then cut off the stems and halve the peppers. Remove most of the seeds unless you want really hot. I usually remove about 80% because we do like a little heat in ours. You don’t have to remove the skin for this recipe, but some of it will come off as you start cutting and removing the seeds. Roast about a quarter cup of pine nuts in a small pan in the already heated oven for 8-10 minutes, until just turning brown. Remove stems from cilantro until you have enough for 1 1/2 cups tightly packed cilantro leaves. Then coarsely chop 3 cloves garlic. Now place the peppers, cilantro, garlic and pine nuts in a food processor and process until coarsely chopped. While food processor is running, drizzle in 1/2 cup olive oil and process until smooth. Toss in the grated cheese and pulse a couple of times to combine. 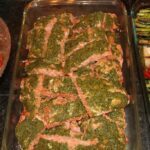 This jalapeño cilantro pesto will keep several days in the refrigerator and can be used with just about anything. 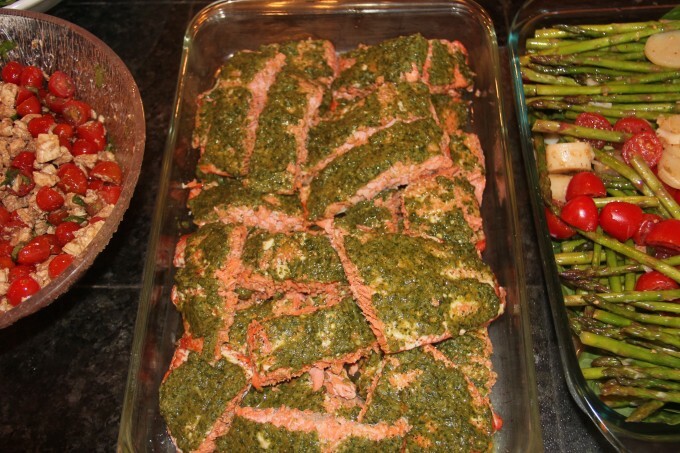 We especially love it on grilled salmon or chicken. Enjoy! A zesty pesto that goes great with fish, chicken or vegetables. 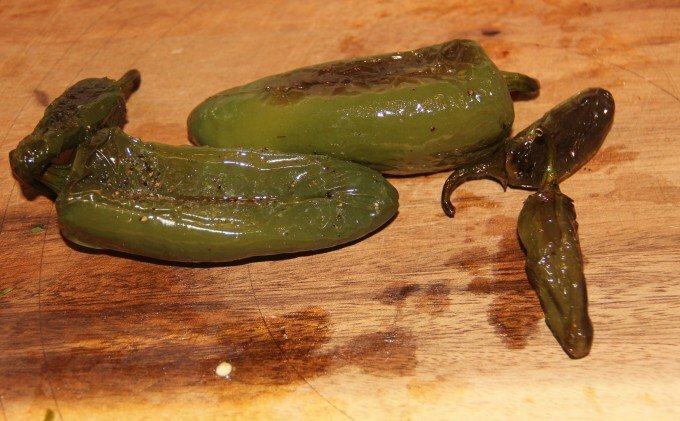 Place jalapenos on a cookie sheet, drizzle with olive oil and sprinkle with salt and pepper. Roast peppers for 20 minutes or until skin is blistered and starting to darken. Remove peppers from pan, place in a bowl and cover tightly with plastic wrap. Let peppers sit for 15-20 minutes, then remove from bowl. Cut stems from peppers, halve and remove most of the seeds. Place pine nuts on a pan and roast in oven for 8-10 minutes until just starting to darken. 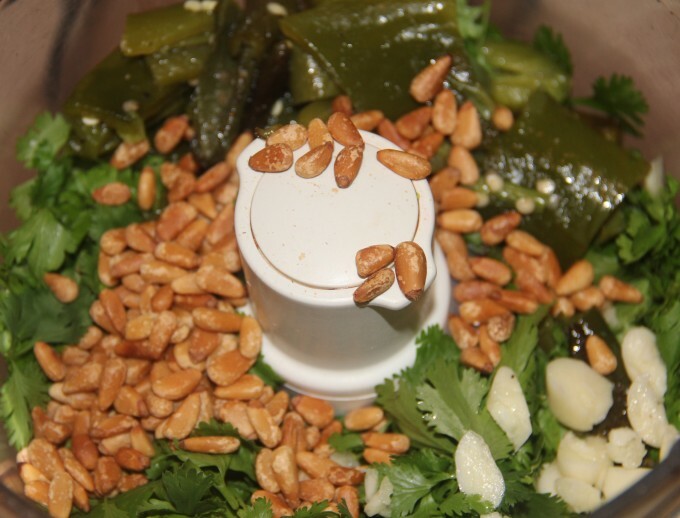 Combine jalapenos, cilantro, pine nuts and garlic in a food processor and process until coarsely chopped. Drizzle in 1/2 cup olive oil while motor is running and process until smooth. Add grated cheese, a little salt and pepper, and pulse a few times until blended. If mixture is too thick, add olive oil a teaspoon at a time and pulse. We don’t even have to guess that I’ll be making this soon. Especially with most of my grilling being done in the Fall, I can’t wait to try this over chicken.